CeBIT Australia 2012 is considered to be one of the largest business and technology events in the Asia-Pacific region, showcasing services and technologies that serve as the back-bone of any organization’s business strategy. This 3-day event, hosted at the Darling Harbour in Sydney, consists of a conference, an exhibition and multiple networking events highlighting the latest trends in technology. Over 600 exhibitors from all over the world plan to display their products and services to the 30,000 business visitors estimated to visit CeBIT Australia 2012. This exhibition covers the entire spectrum of business technology solutions from important processes like Business Intelligence, CRM, to the emerging newer technologies like mobile apps and cloud apps. Rishabh Software, an award-winning software development company, plans to exhibit at CeBIT in order to showcase its strengths in cloud, mobile and web application development. It has partnerships in place with prominent ISVs like Microsoft, Oracle-Sun and Salesforce.com. One approach they intend to pursue will be similar to their venture into the Software-as-a-Service business in 2010 in which they partnered with a US-based company to form ODScommerce, an e-sourcing tool focused on reducing supply chain costs for mid-market customers. They invite conversations with like-minded companies looking to set up partnerships or need help with software development and integration. Apart from the exhibition, the conference that runs concurrently will cover various hot topics of the technology industry. CeBIT Australia 2012 is known for bringing together all the thought leaders and who’s who of the industry on the same platform. With seminars and workshops on topics like Cloud, Social Enterprise, eHealth, Mobile and Online Retail, CeBIT Australia 2012 promises to be an enlightening and beneficial event for everyone involved. 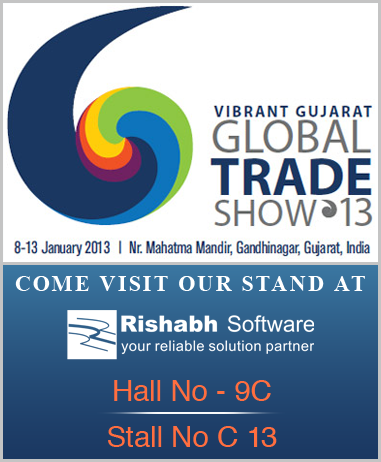 To know more about Rishabh Software, visit their stall in Hall 4, M49 at the CeBIT Australia 2012 Exhibition floor.